Smallholders and rural producers have a vital role to play in overcoming global hunger and poverty, and new and varied partnerships are needed, with particular emphasis on the interests of women, Secretary-General Ban Ki-moon said on February 17th, 2010. He also confirmed that the growing international recognition of the role of agriculture and rural development in poverty reduction is helping to build the Global Partnership for Agriculture, Food Security and Nutrition. Despite the hardships of the global recession, last year saw an upturn in investment in agriculture, along with promises from world leaders of large additional increases over the next three years, he said, thereby underscoring that �we need to continue creating diverse and innovative partnerships that can help people and communities achieve greater productivity, nutritional health and self-reliance. In this respect we must give pre-eminence to the interests of women, who juggle their time between food production, processing, marketing, child care and balancing the household budget�. In every developing country people are suffering from the high food prices. Taking into account that most of the rural women in the drylands spend the major part of their daily life with small-scale agricultural activities, it goes without saying that, when creating diverse and innovative partnerships that can help people and communities achieve greater productivity, the best return on investment will come from the creation of small kitchen gardens close to their houses. There is no need to offer them some financial resources. Funding to start up a family garden can be done as a �micro-credit�, not with a certain sum of money, but in the form of the necessary materials and equipment. Success stories have shown that, in rural areas, offering a family garden to women is the easiest and most efficient way to combat hunger and poverty. However, in urban areas the situation is quite different. With their extremely low income and having barely a patch of arable land, almost all the urban families are confronted with some form of hunger and malnutrition. In Nairobi (Kenya), hundreds of residents of the slums have adopted a new form of intensive gardening: growing vegetables and herbs in sacks. Previously, women in densely populated cities mostly planted vegetables on small plots of barren land. Nowadays, the novel form of gardening in sacks or all kinds of containers can be introduced in every urban area. 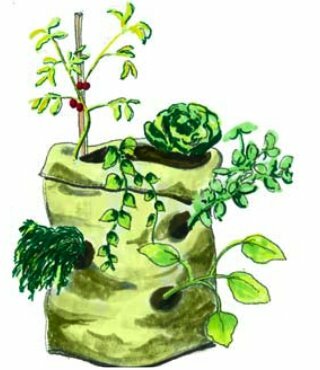 Indeed, as finding even small patches of arable land in a city or a town is becoming almost impossible, sacks or other containers, taking up less space than small-scale gardens, are an interesting solution for food production. With only a small budget, NGOs can easily start up a sacks gardening project with a small number of women and later extend invitations to more women, and even schools, to join the group. This seems to be a fantastic way for almost every urban family or school to have access to affordable vegetables, herbs and fruits. Wherever needed, a short training in sacks gardening can be planned. Women and children can learn in the shortest time these simple gardening techniques of container gardening, in particular those of water harvesting, soil fertilization and adequate irrigation. As sacks gardening can provide a sustainable source of vegetables and fruits, one can foresee a growing success of this novel form of gardening both in rural and in urban areas. NGOs and foundations can help women and schools to fence their gardening plots and to store irrigation water (not drinking water). With a limited number of sacks of vegetables family members or school children do not fear to be hungry. It would be a remarkably easy way of food production in refugee camps, where every family could have a small number of sacks close to the tent. The success of similar projects in developing countries on all continents should encourage NGOs, foundations, banks and international agencies like FAO, WFP and UNHCR to invest in this efficient way of combating hunger and poverty. If there is really a growing international recognition of the role of agriculture and rural development in poverty reduction, helping to build the Global Partnership for Agriculture, Food Security and Nutrition, along with promises from world leaders of large additional increases over the next three years, like Secretary-General BAN KI-MOON said, then it should not be so difficult to set up a programme to promote sacks gardening at a global level. There are all kinds of advances in the sacks themselves. Smart Pots is a reusable grow bag that is lightweight, durable and inexpensive. There are also bags of soil that can be turned into grow bags by just cutting slits into them. I've used re-usable grocery bags for growing vegetables with huge success. I've also read that Earthboxes are being used successfully in the developing world and are particularly good because they are extremely water efficient and need very little fertilizer. Thanks for commenting, Kerry. i agree that Smart Pots and Earthboxes offer excellent opportunities for gardening with a minimum of water and fertilizer. For most people in developing countries, although very successful, these containers remain too expensive. Therefore, I love the idea of propagating the use of sacks or even plastic bags or grocery bags that can be perforated for aeration. I am convinced that there is a big future for container gardening in developing countries, in particular in the drylands. Having spent a couple of years in remote villages in Sub-Saharan Africa, I can assure you that our perspective of what we think is often not aligned to the realities of the actual conditions in most/all developing countries. Cans and sacks are never discarded but always reused for an inconceiveable variety of unintended purposes. There is no question, however, that there is not enough wealth to purchase even the most simple commodity. What I like most about using sacks is that they can be easily sent in quantity to a destination village or project at very little cost to the sender! Our task is to simplify the process to its least significant denominator. THEN, it has a chance for success. Ideal for arid areas where water is scarce. There is no limit to imaginiation and innovation. Where does the growing medium come from? I think this is a wonderful idea and, as another commenter said, sending sacks is cheap and easy but sending soil is not. To a large extent the nutritional value of the food grown depends on there being reasonably fertile soil. I cannot agree more with Tony Simeone: however performing commodities or technologies are, most of the people in developing countries are too poor to purchase them. That's the reason why splendid modern devices are only successful when offered for free, e.g. through development projects. Any NGO or Foundation can easily purchase a large number of sacks or bags, together with the necessary seeds of vegetables and fruit trees, and send them to their projects. Within the shortest period the local people will be growing fresh food close to their house. If applied at larger scale, it would be one of the best practices to alleviate hunger and poverty in a sustainable way. Ramesh is right when confirming that container gardening in general, and sack gardening in particular, is an excellent tool in the drylands, where scarcity of water and poverty are going hand-in-hand. It's very encouraging to see that rural and urban people, suffering from drought and limited in financial means, show such a rich imagination, transforming 'ordinary' sacks into an oasis. Yvonne Rowse comes up with a practical question about the growing medium. Sending sacks to people in need is so simple and inexpensive that every organization (NGOs, Foundations, even the International Agencies like FAO, WFP and UNHCR) can provide, within their budget, a small number of sacks or grocery bags to every family in the drylands. They don't have to send the substrate in which the food crops will grow. Sacks or bags can be filled with a growing substrate (a sort of potting soil) prepared locally. It suffices to mix the right volumes of local soil, organic matter like manure or compost and some sand (to make the mixture lighter). There is even no need to add some mineral fertilizer if the local soil contains some loam or clay, because the mineralization process will provide sufficient nutrients (except if one or another micronutrient is lacking in the local soil). But also that can easily be solved by the donors. Thanks, Yvonne. What this really comes down to is utilizing legacy experience with creative, low-budget funding to demonstrate how to execute small scale pilot projects. I welcome anyone interested in participating in the execution of such a strategy to contact this prototype effort at: projectgarden@dimidia.com . This email address will be available by 18:00 Friday. I am confident that Professor Van Cotthem will welcome our joint, creative efforts to join us in the selection of locations and garden contents. My Comment to ?Technology Transfer for the Poor?